The International Game Fish Association has announced the 2017 inductees to the Fishing Hall of Fame. This year’s 2017 inductees include Rick Clunn, Larry Dahlberg, Peter Fithian, Mike Levitt, and Dr. Eric Prince. Dania Beach, Fla. – Nov. 1, 2017 – The International Game Fish Association (IGFA) Fishing Hall of Fame Class of 2017 was honored on Sat., Oct. 28, in a ceremony held at the new IGFA Fishing Hall of Fame located in Johnny Morris’ Wonders of Wildlife National Museum & Aquarium in Springfield, Mo. The 2017 inductees include Rick Clunn, Larry Dahlberg, Peter Fithian, Mike Levitt, and Dr. Eric Prince. 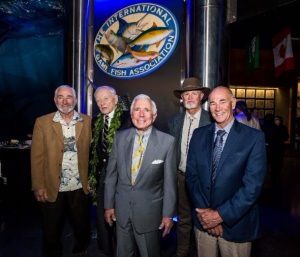 These five anglers join 116 fishing greats in the IGFA Fishing Hall of Fame and were recognized for their extraordinary achievements in recreational fishing around the world. To learn more about the IGFA Fishing Hall of Fame, its members, or to submit a nomination, please visit the IGFA website, http://www.igfa.org/. The IGFA Fishing Hall of Fame recognizes extraordinary achievements in recreational fishing around the world by anglers, captains, scientists, conservationists, writers, or fishing industry leaders. The first class, honoring 29 of the sport’s luminaries, was inducted in 1998. Since then, 87 additional fishing greats have been welcomed to the Hall at the annual induction ceremony in October of each year. To learn more about the 110 current members of the IGFA Fishing Hall of Fame, please visit the IGFA Hall of Fame webpage for biographies of previous IGFA Fishing Hall of Fame honorees. Founded in 1939, the IGFA is a non-profit organization committed to the conservation of game fish and the promotion of responsible, ethical angling practices, through science, education, rule making, record keeping and recognition of outstanding accomplishments in the field of angling. The IGFA also maintainsworldwide game fish records in freshwater, saltwater, fly fishing and junior angler categories. IGFA members are located in over 100 countries.